Significant bleeding may occur from various sources, including the epigastric vessels, the crossing veins over Cooper's ligament, and the iliac vessels. 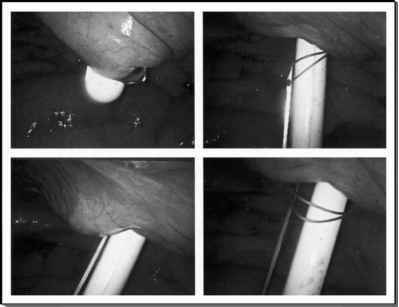 Proper trocar placement and dissection in the correct plane prevents injury to such vessels. Avoidance of tack placement below the iliopubic tract and constant palpation of the tacker against the abdominal wall will ensure correct placement of tacks. However, if nerve entrapment occurs in the immediate postoperative period, the patient should be brought back to the operating room for tack removal. TABLE2 ■ Postoperative Complications crossing vein over Cooper's ligament will help the surgeon in avoiding these structures during the dissection.